It has been reported that Microsoft is killing their ill-fated Zune player, allowing the company to focus on other devices. For those of you that didn’t know about the Zune (I’m not surprised), it was Microsoft’s attempt at an iPod. First released in 2006, it never was as easy to use or had the integration with a service like iTunes that made the iPod such a success. It could also be argued that younger demographics see Microsoft as a brand their parents used, not a brand they identify with. The Zune is just another in a long line of digital media players from a variety of well-known and not-so-well-known companies to fall by the wayside in the last 10 years since the iPod was introduced. The question to ask is if Microsoft couldn’t crack the iPod market, can anybody? And the follow up question is what about the iPhone and iPad markets? For what it’s worth, the fact that Microsoft couldn’t make inroads against the iPod may be as much of an indictment against Microsoft as it is an indication of Apple’s strength in the market. But the demise of the iPod has been predicted nearly every year by so-called experts in the field and it has yet to happen. So the failure of the Zune isn’t just due to any incompetence on Microsoft’s part, especially when companies like Sony with their Walkman brand had no better results. Let this be a wake-up call to anyone who is sitting on the sidelines, hedging their bets on the iPhone and iPad. If this story teaches us anything it is that Apple certainly is not a flash in the pan. Those who are waiting (hoping?) for the market to catch up with Apple are letting their competitors who are already leveraging these technologies gain the upper hand. 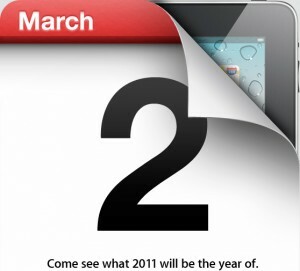 In case you haven’t heard yet, Apple is holding a “media event” tomorrow, where most likely they will be introducing a new iPad. The media members that were invited to the event were given the invitation pictured. Sort of gives it away, don’t you think? Stay tuned for details once the announcements are made.